Musically, Seeger was both a songwriter and, like his idol Woody Guthrie, a great interpreter of America’s most resonant folk traditions. The first concert I ever saw was Pete Seeger playing Carnegie Hall in 1970 when I was a toddler. (“What took your parents so long?” my friend John Nichols asks.) Since then, I was privileged to see him sing at numerous shows, labor rallies, anti-apartheid protests, annual Clearwater Festivals, an environmental fundraiser, an early Farm-Aid benefit, after breakfast at my lefty summer camp and, most recently, on the streets of the Upper West Side of Manhattan at an Occupy rally in the fall of 2011. 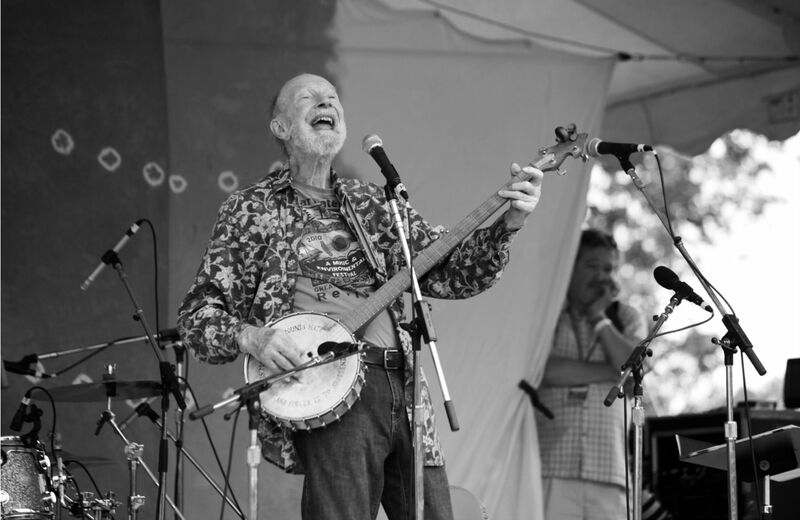 Musically, Seeger was both a songwriter and, like his idol Woody Guthrie, a great interpreter of America’s deepest folk traditions. He didn’t write “We Shall Overcome,” the iconic anthem of the civil rights revolution, but no one played a greater role in popularizing the song. His most famous original compositions, “If I Had a Hammer,” an immortal tale of perserverance and "Where Have All the Flowers Gone,” a haunting lament over the absurdity of war, are now and forever a core part of the culture of protest in the United States and around the world. Seeger’s life and legacy resonated deeply with generations of artists and activists of all stripes and inspired considerable musical tribute; this list is meant simply as a starting point for discussion (and listening!) Please use the comments field below to let me what I missed.